The Astro module of Optuma includes a fully user-definable 3D ephemeris which instantly displays any number of planets, asteroids, node positions and other planetary bodies, allowing key planetary relationships to be easily identified. Non-standard items, such as minor asteroids, can be imported into the chart. 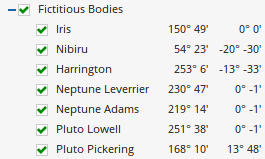 The ephemeris is broken up into the twelve houses of the zodiac and also takes into account declination, displaying the planetary bodies in their true position according to Longitude and Declination. To access the ephemeris select it from the Astro section located under the New menu. 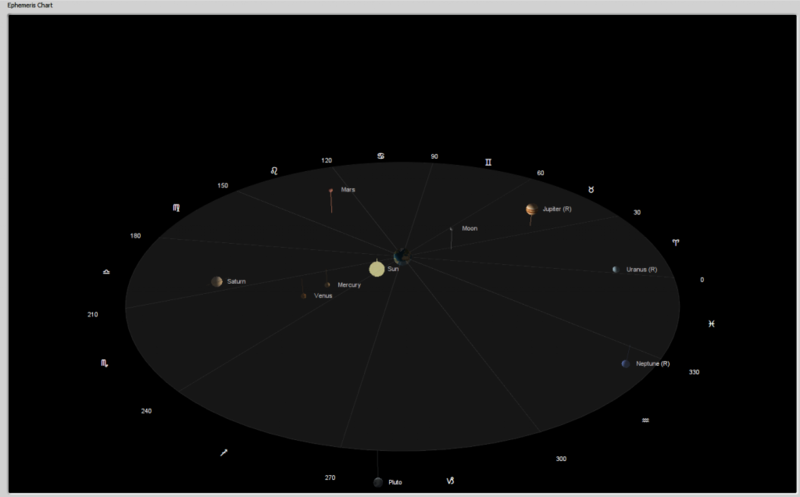 The Optuma 3D ephemeris shows the 360-degree circle with the selected planets / bodies in view inside the ephemeris. The ephemeris is broken up into the twelve houses of the zodiac. The angle of each house is displayed on the outside of the circle, starting from zero degrees Aries. The selected planets will be displayed inside the ephemeris using either the Earth or the Sun as the centre point (depending on whether Geocentric, Sidereal or Heliocentric has been selected). 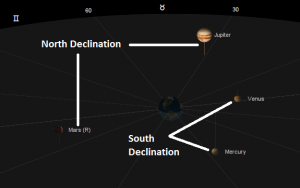 A line joining the ephemeris and the planet will be displayed to indicate whether the planet has a North or South declination to the Sun or Earth. 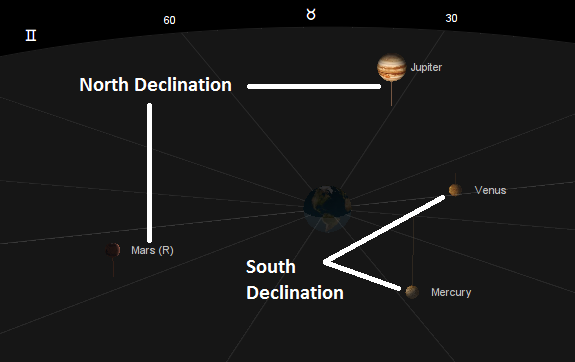 The length of the line will also give an indication as to where a planet’s declination is in relation to other planetary bodies. Where a planetary body has an (R) next to it, this is an indication that it is in retrograde. The Optuma ephemeris can be moved in any direction to allow you to view any aspect of the ephemeris from any angle. To move the ephemeris, place the mouse pointer in any location and hold the left mouse button down. While the left mouse button is held down, move the mouse pointer left or right to move the ephemeris around. Move the mouse up or down to change the angle at which the ephemeris is viewed. To zoom in and out of the ephemeris, hold the right mouse button down and move the mouse away from you to zoom out, and towards you to zoom in. Print Chart: Prints the active page, which is opened as a PDF. Restore Default Settings: Click this action if you have adjusted the default settings of the Ephemeris, and wish to return to the standard properties originally installed with Optuma. Save Aspects to Clipboard: Copies the raw data values of the selected aspects (planets, dates, aspects, angle) to your clipboard, which can then be used in other programs (such as Notepad, MS Excel, etc). 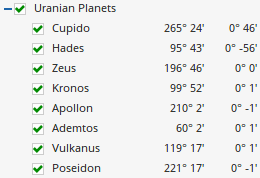 Save Planets to Clipboard: Copies the raw data values of the selected planets (name, right ascension, declination) to your clipboard, which can then be used in other programs (such as Notepad, MS Excel, etc). 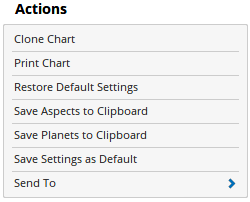 Save Settings as Default: If you have adjusted any of the ephemeris settings (selected planets and aspects, for example) you can save the adjustments as your new default setting. Each time you open a new ephemeris it will display using the new settings. Number of Rings: Click here to increases the number of rings in the ephemeris. 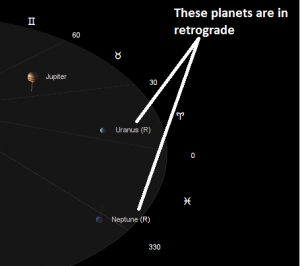 Real (log) – uses a logarithmic calculation, based on their proportionate distances from each other, to position the planets on the ephemeris. Fixed Points: Manually enter the angle and name of fixed points. 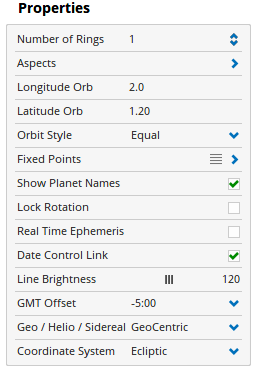 Show Planet Names: Untick this box to remove the names of the planets from the ephemeris. Lock Rotation: Tick this box to prevent the ephemeris from rotating. Real Time Ephemeris: The ephemeris will show the time and date when it was opened. Click here to have the ephemeris continue to update in real-time. Date Control Link: When using the Open for Date action, this property allows you to choose between having the Ephemeris chart linked to the chart or not. Line Brightness: Use the slider to adjust the brightness of the lines dividing the houses. When the ephemeris is opened a structure panel will appear on the right side of the screen. 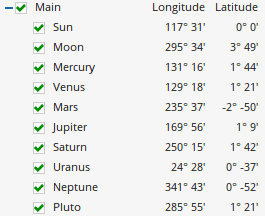 This is where date and time of the ephemeris can be set, and the planets and bodies to be displayed can be selected. From here you can move forward and backwards in time, by either pressing the ‘+’ or ‘-‘ buttons in minute, day, year or century increments. Alternatively, drag the slider to the left or right. To select a specific date click on the date icon in the bottom-left corner to open a calendar. 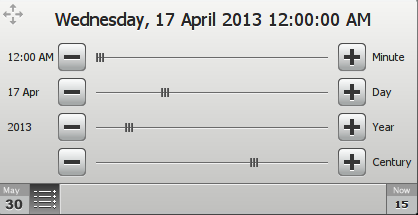 Step 2: – Open the text file and locate the required asteroid, noting its code in the first column. Step 3: – Download the specific file for that asteroid from here. The folder you need to open depends on the code of the asteroid. For example, if you wish to import asteroid 020469 drop the first number of the code and locate folder ast20 (another example: codes beginning in ‘000’ are located in folder ast0). Before continuing, you will need to use My Computer to go to the Optuma program folder (listed above) and create a sub-folder using the same name as the folder from the FTP site the ephemeris file is located (ast0 for example). Once the sub-folder has been created go back to the ephemeris FTP site, locate the file (e.g. se20469s.se1) right-click on it to ‘Save Link As’ to. Save the file in the sub-folder you created. Step 4: – Restart Optuma and open the ephemeris. The imported data will now be available in the structure panel under ‘Asteroids’.